Are you longing to pack your bags and work from your laptop while sipping on cocktails in Mexico? Well, your two scrolling thumbs could be the keys to making your digital nomad dreams a reality. Instagram is more than just another social media network. It’s THE most important online platform for businesses today. And it’s not too late to swap your office desk job for the desk-free option as an Instagram Marketer. Found cheap flights for that trip to Jamaica? Great! All you need to do is plan your work schedule around your travel plans and say goodbye to having to request vacation days ever again. 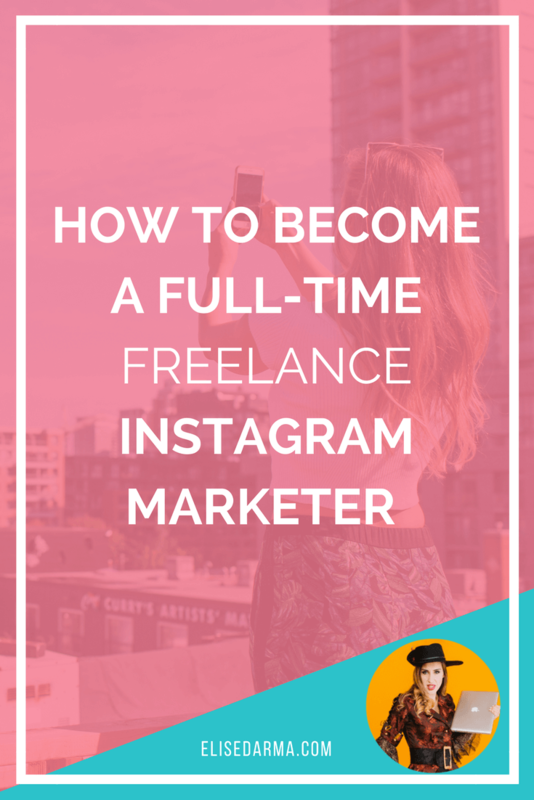 Here’s how to kickstart your freelance Instagram marketer career and turn it into your full-time gig! An Instagram Marketer is a social media manager who specializes in managing and growing Instagram accounts for clients. Researching your client's industry thoroughly. Creating engaging posts that will attract their ideal follower. Researching targeted hashtags to reach their target follower. Responding to comments, tagged photos and DMs. Monitoring analytics and using the results to optimize the client's account. Leveraging Instagram's advertising platform to expose the brand to a specific audience. What Skills Do You Need To Be A Successful Instagram Marketer? Writing a witty Instagram caption isn’t always the easiest thing to do. But the good news is that you don't need to be the next J.K. Rowling to be a successful Instagram Marketer. As long as your caption shows your brand’s personality, talks directly to your target follower and gives clear calls-to-action, you’ll be converting those casual swipers into paying customers in no time. If you want to grow an Instagram account, you need to invest quite a lot of time into research. Trying to attract everyone on Instagram to your account will never work. You need to be specific about who is your ideal follower. What similar accounts they already follow and why? What content do they respond to the best? What hashtags can help you find your dream customer? Once you know all of that, it will make your job of growing an organic and engaged following that much easier. Instagram’s algorithm is constantly changing. To make sure your posts get as much engagement as possible, you need a solid content strategy backed up by analytics to help you make the right decision. Use Instagram’s built-in analytics with business accounts to find out when the best time to post is for each day of the week. By combining that with content you know your followers will love, your posts will get more likes, comments and saves. The algorithm also favours accounts that post at least once a day, so you need to develop a strategic content plan to make sure you have quality content for each day of the week. As a 5-star airline, that response would be totally out of character. Using the right tone is an important skill to develop when managing someone else’s online community. You need to make sure you can respectfully answer their followers' questions while still staying true to the brand’s personality. Is an Instagram Marketer A Full-Time Job? Instagram Marketing is one of the most lucrative social media niches. Instead of spreading yourself thin over multiple platforms, fine tune your skills for Instagram and become an expert. Depending on your experience and the scope of work, you can charge an hourly rate between $20 and $50. As you gain more experience and develop your skill set, you’ll be able to charge $500 per month per client. Once you hit that goal, you’ll have a full-time income with six clients, and you can quit your day job and join the ranks of travelling freelancers. So How Do I Become an Instagram Marketer? If you’re an Instagram newbie or you’re at a loss when it comes to growing an account from the bottom up – invest in yourself and sign up for a course. My free Instagram masterclass is designed to teach you strategies on how you can get your next 1,000 followers (and yes, these strategies totally work for client accounts too). You can also sharpen your copywriting skills for all those captions you're about to write by taking a free masterclass like the one that Jamie Jensen offers on conversion copywriting. You can’t become an Instagram extraordinaire overnight. You need to spend time in the app trying out all the features, fine-tuning your profile, experimenting with different types of content and engaging with potential followers. Do research on your competitors, look out for examples of different Instagram feed themes you can try, and make a list of "low competition" hashtags that are in your niche. Instagram also favours accounts that use the new features they have spent MONTHS working on. So go live on Instagram and connect with your followers, run a poll to find out what makes them tick, or boost your discoverability by using the Location and Hashtag features in your Instagram Stories. Ready to start bringing in that extra cha-ching by running Instagram accounts for clients? Share about your new skills and services on your social networks. Respond to jobs on sites like Upwork and Freelancer. Update your LinkedIn Profile with your new skills and job title. But most importantly – make sure your Instagram profile is optimized to help you attract potential clients. Not sure how? I’ve written a detailed guide that will turn your dull Instagram account into a lead generating machine! Still Don’t Believe It’s Possible to Earn a Full-Time Income as an Instagram Marketer? Cara Gray joined both my courses InstaGrowth Boss and Freelance Biz In A Box back in the spring of 2017. By October, she had signed her second client for her Instagram services business. "I am done with my day job at the end of 2017 and am doing IG full time. I am really excited! I have been available to my boss 24/7 for the last 20 years. Such a big, welcome, planned change! You are amazing, BTW - perfect time in my life with all of your programs." Inspired? Motivated? Ready to Learn? Here's my step-by-step guide detailing how to turn your side hustle into a full-time business within 6 months. Unsure how to grow your Instagram account, let alone get clients? Sign up for my FREE Instagram masterclass where I'll be sharing my top three tips for gaining 1,000 followers in 30 days.